The saying below really hits the nail on the head. We often hear about illusions being tricks of the eye, but this isn’t quite accurate. 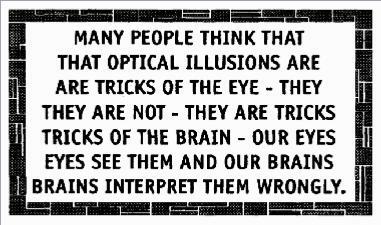 Optical illusions and similar images are more tricks of the brain. It’s not necessarily what our eyes see, it’s how the brain interprets what we see. And, it’s not just images that can trick our brains either. A word illusion can also trip us up as well. Sometimes a word illusion can be so subtle that we miss it the first time around. In fact, I’m going to see just how well you were paying attention to today’s illusion. If you didn’t and caught it right away, congratulations! You’re probably in the minority. If you did miss it, though, don’t worry. You’re definitely not alone. Most people would probably miss the fact that the saying above is an illusion itself. Can you see something a little off about the image above? If you liked today’s word illusion, you might also wanna head over and check out this hidden word room!